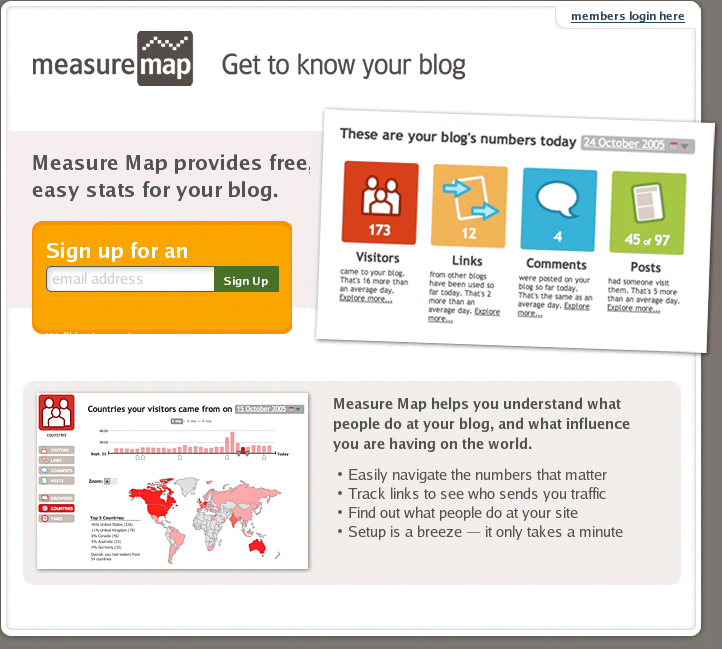 I've been using MeasureMap for a while to monitor blog traffic. Jeff Veen just mailed out to MeasureMap's alpha testers that it has been acquired by Google. It's blogged by Google here. For the near term, you will see no difference in its operations. Not quite true: it looks like the modding of the home page to add the Google link has messed up the layout horribly (linux/firefox)! Hopefully this acquisition will not see the problems that Google's acquisition of Urchin produced. At that time, Urchin became unusable and there were many complaints from existing users about price restructuring. BlogBeat, which I posted about earlier, looks like it is making some significant changes. Unfortunately, I can't seem to log in and during the upgrade access seems problematic. MeasureMap has set a seriously high bar for blog specific site stats, so it's going to be exciting to see what the new version of BlogBeat looks like. Stay tuned. Like Steve Rubel and, I'm sure, many others, I got a glimpse of my Google Analytics results last night. I have to say, I was really impressed with the functionality and much of the interface design. However, the quality of the service is so poor that it out-weighs anything one can say about the interface. I attempted to login this morning and at every try was redirected to the standard Google search page. My initial reaction to the Google data was to suspect that MeasureMap was going to be dead in the water. However, it is important to underline the fact that MeasureMap is a weblog stats tool, not a general website stats tool. Consequently, it explicitly models the structure of and possible interactions with a weblog and reports data on vistor behaviour with respect to these. This feature, together with the fact that it actually works, unlike Google's offering, means that I am unlikely to revisit my stats page at Google for a while. The demo has been temporarily disabled. While Mint can easily handle recording hundreds—if not thousands—of hits a minute, it is not optimized to display data at that rate. Please check back once some of the initial interest has died down. The heat from the blog space is giving rise to secondary applications, but I'm surprised that these are being rushed out (just as BlogBeat was - still full of glitches) with minimal QA. The beta tag is always convenient, but it is becoming overly used to indicate lack of discipline IMHO.